1. Which of the following organisms is able to regulate its own body temperature? 6. In a certain ecosystem, the primary producers represent 100,000 kcal of energy. Assuming a 10% transfer of energy between trophic levels, how much energy is available to the fourth trophic level? 7. Which of the following represents the proper ecological hierarchy? 8. The following data table shows the number of different amino acids in the beta hemoglobin chain of various organisms compared to the human beta chain. 9. The following data table shows the number of different amino acids in the beta hemoglobin chain of various organisms compared to the human beta chain. Can both animals and plants obtain their nitrogen from the atmosphere? A. 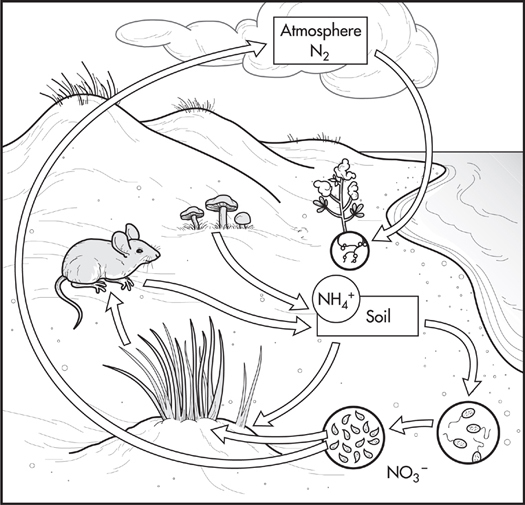 Yes, both animals and plants take in nitrogen during respiration. B. Yes, most of the nitrogen in the cycle is in the atmosphere. C. No, only plants can take in nitrogen from the atmosphere. D. No, they must consume it through eating or uptake from the soil. E. No, they must obtain it through symbiotic relationships. Which of these structures would be used for grasping? Based on physical similarity, which skulls appear to be most closely related? What is the most advantageous difference between the ancestral primate skulls and the modern human skull? 16. Six pairs of bald eagles were released into the wild in Indiana. Four of the pairs of birds successfully nested and raised young. Two of the pairs nested near an industrial complex that released waste products (PCBs) into a nearby lake. These birds laid eggs, but the embryos failed to develop. Which of the following is the LEAST likely reason for the failure of the embryos to develop? A. Mutations in the embryos halted their development. B. The adult birds failed to exhibit proper nesting behavior and did not care for the eggs. C. The contaminated lake water that the birds consumed affected the development of their young. D. The sperm of the males were affected by the PCBs in such a way that they were unable to fertilize the eggs. E. Indiana is not a good location for bald eagles to mate and reproduce. 17. Six pairs of bald eagles were released into the wild in Indiana. Four of the pairs of birds successfully nested and raised young. Two of the pairs nested near an industrial complex that released waste products (PCBs) into a nearby lake. These birds laid eggs, but the embryos failed to develop. 18. Questions below wrefers to the following data obtained for a rabbit population over a period of several years. Which of the following graphs best represents the data on rabbit population size? 19. Questions below wrefers to the following data obtained for a rabbit population over a period of several years. Assuming unlimited resources, what would be the approximate expected rabbit population in Year 5 ? 20. Questions below wrefers to the following data obtained for a rabbit population over a period of several years. Ultimately, the amount of nutrients and other resources would become limiting. What would happen to the rabbit population at that time? I. It would reach the carrying capacity of the environment. II. It would continue to grow indefinitely. III. It would engage in intraspecific competition.